Have you ever considered the possibilities of a career in the printing industry? Looking for a career with a growing company? Maybe you’re our next employee! 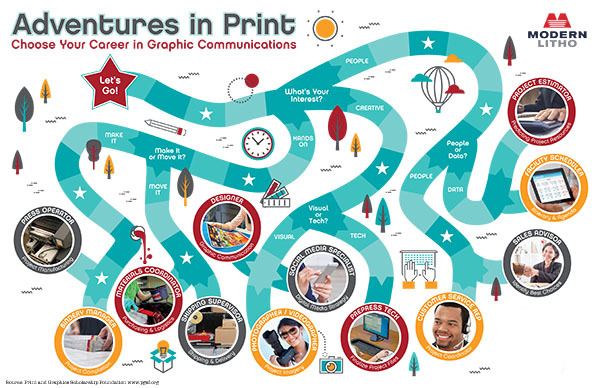 So many different paths are available in the printing industry today! Click image to view PDF. The printing industry has been set afire with new technologies and platforms that not only increase the value of print; but also prove the industry is resilient and relevant! Modern Litho and its subsidiaries have grown into a nationally recognized, award-winning company that has a great deal to offer its employees. We are always looking for quality individuals to add to our team. We are always accepting applications, so please email us to obtain information about any current openings we have. Modern Litho – Jefferson City is hiring for a Billing Specialist. Billing requires the knowledge of operations, machinery, paper, and production within Modern Litho. Assists with daily preparation of pre-invoice for the billing of jobs. Verifies invoices against purchase orders and price quotations. Analyzes estimates against actual costs and document discrepancies. Prepares comparative pricing on all jobs without quotations and verifies against any customer purchase orders. Processes and evaluates daily production and material transactions for preparation of reports. Works with other departments to test, implement and maintain software changes and updates. Must be organized and manage details well. Must be able to multitask, able to prioritize and have the ability to work under stress. Must manage details well and have good verbal and written communication skills. Must be highly productive and able to maintain accuracy, efficiency and quality. Must have good analytical skills and product knowledge. This is a full-time position with a competitive benefits package. Modern Litho – Jefferson City is hiring for Press Operators on our night shift. Press Operators work 12.5 hours (6pm – 6:30am) for three nights on a shift rotation, plus overtime as needed. Must have strong mechanical and technical skills, be quality minded and have strong attention to detail. Operators should have a good work and attendance record; should possess the mathematical skills necessary to compute percentages, weights and measures; basic computer skills; ensure quality of printed image and accurate registration. Work involves mental and visual attention, accuracy and efficiency. This is a full-time position with a competitive benefit package. Modern Litho – Jefferson City is hiring for a Folder Operator. This is a full-time position eligible for a full benefit package. Working hours are 9:00pm – 7:00am, Monday through Thursday. Requires moderately heavy lifting, pushing, and/or pulling. Employee may be requested to work overtime when necessary. Must have strong mechanical and technical skills, be quality minded and have strong attention to detail.